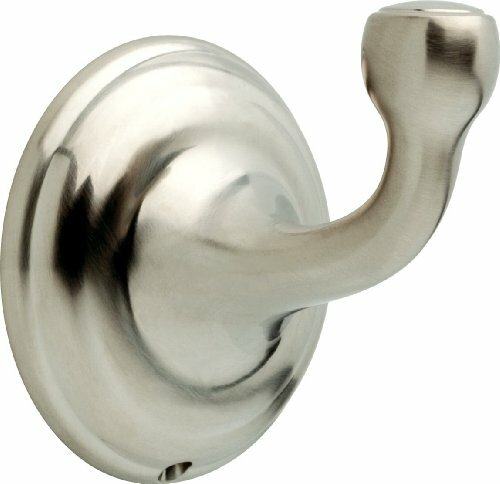 Complete the look of your bath with this Windemere Robe Hook. Delta makes installation a breeze for the weekend DIYer by including all mounting hardware and easy-to-understand installation instructions. You can install with confidence, knowing that Delta backs its bath hardware with a Lifetime Limited Warranty. Windemere, a stylish Delta Collection, with sculpted curves and whimsical design, will help you create the renewed and fashionable bathroom you desire with coordinating faucet, shower head and bathroom accessory options. The traditional styling of this product displays class and endures through time. Windemere is available in Polished Chrome, Stainless Steel, Brushed Nickel and Oil Rubbed Bronze finishes. This robe hook will contribute to bathroom organization .